The Wisconsin Association for Runaway Services, formed in 1979, is a coalition of community based, voluntary, non-profit agencies. The Association's members provide preventive and crisis counseling, temporary shelter, and referral services to youth in crisis. Family mediation is also provided to bring about reconciliation with parents, if possible. Program services are available on a walk-in basis, as well as through 24-hour crisis lines. The goals of the member agencies are to strengthen families, prevent family dissolution, promote self-sufficiency, and ensure permanent, stable homes for youth. In many instances, youth leave home due to family conflict, typically caused by lack of communication. Other times they are forced out of their homes by parents or leave to escape sexual or physical abuse. Returning a youth to this environment without an attempt at resolution can result in more runaway episodes, continuing family conflict, or even more tragic consequences. Runaway programs have seen major increases in homeless youth. These youth, who live "on the street", are in very high risk situations, with few resources and virtually no support system. As a response to this phenomenon, the Wisconsin Association for Runaway Services, in collaboration with the Wisconsin Board for National and Community Service, provides a team of AmeriCorps members to provide street outreach services and mobile response teams for referrals from police departments, schools, and other youth serving agencies. The AmeriCorps members are available to youth who are homeless, runaways, or in crisis and are therefore "on the street". Members frequent areas in the community where youth congregate, such as parks, malls, convenience stores, etc. Youth are provided with hygiene packets, food vouchers, transportation vouchers, clothes, educational materials, and, most importantly, referral services to provide them with safe alternatives to the street. The members also are available to police and school personnel, by responding directly to referrals. Twenty-five AmeriCorps members are providing these outreach services in 36 counties, ensuring runaway, homeless, and youth in crisis have a strong support system and alternatives to the street. The average runaway program receives less than $55,000 in federal and state funds to serve runaway and homeless youth. On the average, there are 1116 juveniles reported missing per program service area. Due to budget shortages, most runaway programs have limited staff, who are unable to leave the offices where they are providing 24 hour coverage and person to person intervention services. Since the Wisconsin Children's code prevents the entry of most runaways into the court system, the 10,000 runaways annually, who are picked up by police in Wisconsin, are being returned to parents without help for the problem that lead to the runaway crisis. Police personnel can release a youth to a runaway program, but rarely do so because of the time involved with transportation. The offer of immediate access to services by trained, mobile, AmeriCorps members, who meet with runaways and wait to meet with parents at police stations greatly increase the number of police referrals. The same, immediate, on-site response is offered to school counselors and social workers. Resistant youth who have weathered multiple runs and are conditioned to life on the street or youth who are homeless, are often not aware of resources available to them. 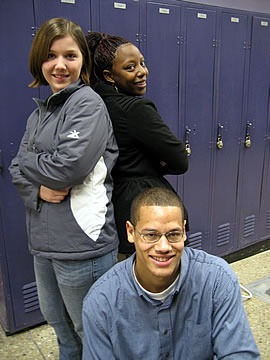 AmeriCorps members are known to these youth through extensive street outreach. Their contacts are geared toward establishing trust and being available for help in crises, such as sickness, personal conflicts, sexual exploitation, and homelessness. Increase the number of hotline, police, and school referred runaways who receive counseling, shelter, and other services. Provision of street outreach services, ensuring hard to reach youth are offered safe alternatives to living on the street. Boys and Girls Clubs of the Fox Valley, Inc.
Where will I sleep tonight? I could have never found the answers. The author is a full-time AmeriCorps member at the Youth and Family Project in West Bend, WI who works with the Transitional Housing and Street Outreach programs. She hopes to receive both her professional counseling and alcohol and drug counseling licenses and continue to work with youth in Wisconsin. My name is Jenna Van Der Sande and I'm an Americorp for Project Youth, part of Lutheran Social Services. My area of service is in Sheboygan County and I am a first year Americorps. I really enjoy working the youth and families in my area, this experience has opened my eyes and I appreciate the opportunity to serve my community. My pieces are about what our goal as an outreach team and about a youth that we service through our drop-in program that I admire. Did I erase any hurt? An inquisitive "Where were you?" Author Biography: Erin Roemer is an MSW Graduate Student who resides in Brookfield, WI. Under the direction of the Wisconsin Association for Homeless and Runaway Services, she serves as a Street Outreach Program worker at the Youth and Family Project, Inc. in West Bend. AmeriCorps Network of programs (AmeriCorps State and National) supports a wide range of local service programs that engage thousands of Americans in intensive community service each year.